Evolutionary Computation Evolutionary algorithms is the name for a group of algorithms that mimic the natural processes of evolution and genetics. Genetic algortihms, the main member of this group, is a software structure based on mechanisms of natural selection and genetics which can be used to solve problems where traditional search and optimization methods are less effective. They mimic natural processes of populations, chromosomes, replication and selection of the fittest. Possible solutions to an optimization problem are generated and encoded to form a population of chromosomes. Replication takes place according natural laws including crossover and mutation. From the pool of newly generated chromosomes the fittest ones are selected to carry on to the next generation. After the computer has generated many generations in the space of minutes the best solution is selected and decoded into the optimized solution. Genetic Algorithms can search a vast space of solutions and quickly zoom in on the best ones by this process of natural evolution. 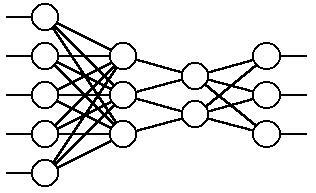 Neural Networks Neural Networks are software structures that imitate the human brain's interconnected system of neurons. A neural network can learn by continuously changing the strength of the connections between these neurons. Signals that are entered and then passed between the neurons are either inhibited or enhanced depending on what the network has learned. The resulting output signal then represents the solution to the input problem. A neural network can be very effective in pattern recognition and optimization. Fuzzy Logic Computers work with binary mode where a value will have a hard and crisp value like 20 or 12. Humans work with natural fuzzy values where a variable will have a natural semantic value like good, bad or in between. A schedule can be good, just ok, very good or maybe plainly bad. The schedule is to a certain degree good but at the same time to a certain degree just ok. It can be both values at the same time but to a certain degree. With crisp values this is not possible. A number cannot be 20 to a certain dgree and at the same time be 12 to a certain degree. To be able to work with these more human values a computer can use fuzzy logic. Using fuzzy logic the software can express but also use input from the users in natrural language statements. Do you use this resource yes or no? Well sometimes a bit and sometimes not at all. It depends. Welcome fuzzy logic!